Forming a 1.1-mile circuit starting and ending at the Visitor Center, I’ve dubbed this hike in Virginia’s Prince William Forest Park—for lack of a better label—as the “Visitor Center Loop.” This is an ideal walk for those looking for a short and convenient stroll near the park entrance—perhaps an afternoon cool-down after a longer jaunt, or a good place to take young kids or walk the dog. 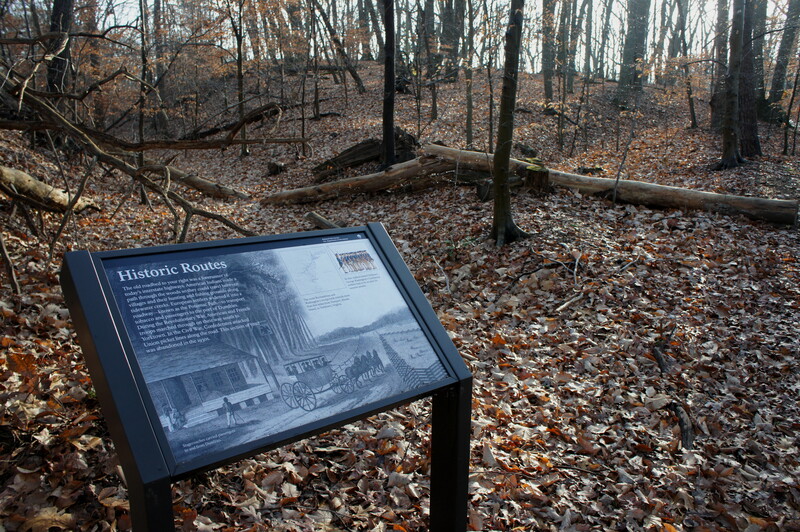 There’s a little history sprinkled in along the way: part of the loop follows The Crossing Trail, which skirts a section of the old Telegraph Road, where George Washington and Rochambeau marched their troops to a decisive victory at Yorktown in 1781. 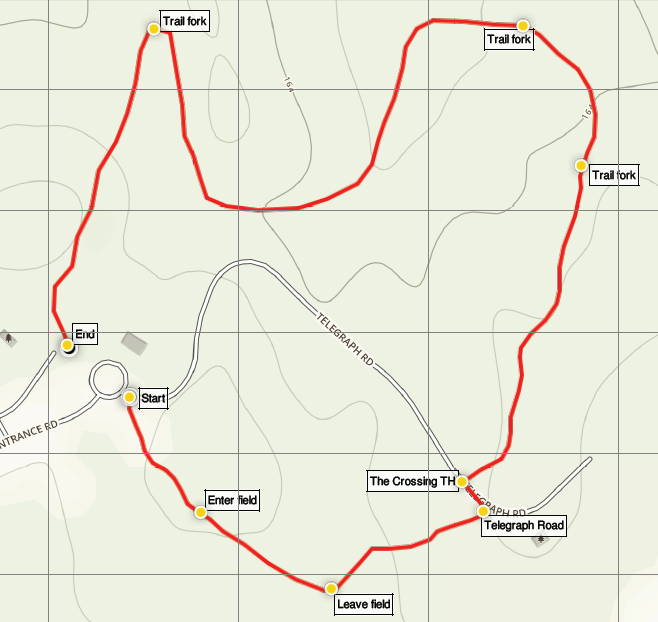 The Visitor Center at Prince William Forest Park is situated on a roundabout, about 6/10 mile from the park entrance. (Note: You will want to park in the parking area off the road to Pine Grove Picnic Area to the west, as there is no parking in the roundabout.) 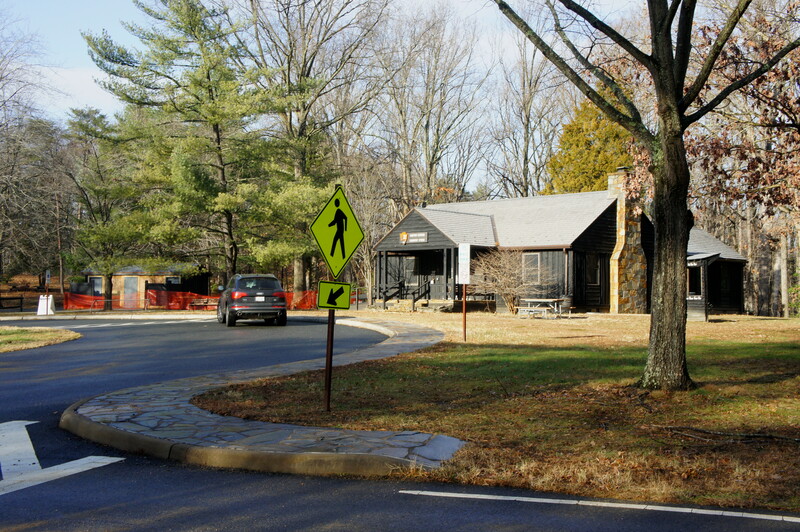 The Visitor Center Loop begins to the southeast of the circle, at the spot where the roundabout meets Telegraph Road, which heads east toward the Telegraph Picnic Pavilion. Walking just past the open gate, take a right on the well-trodden path heading into the woods. This unnamed trail weaves amid chestnuts, hemlocks, beeches, and holly bushes for around 125 yards, then emerges onto a grassy field with a baseball diamond and volleyball pitch. 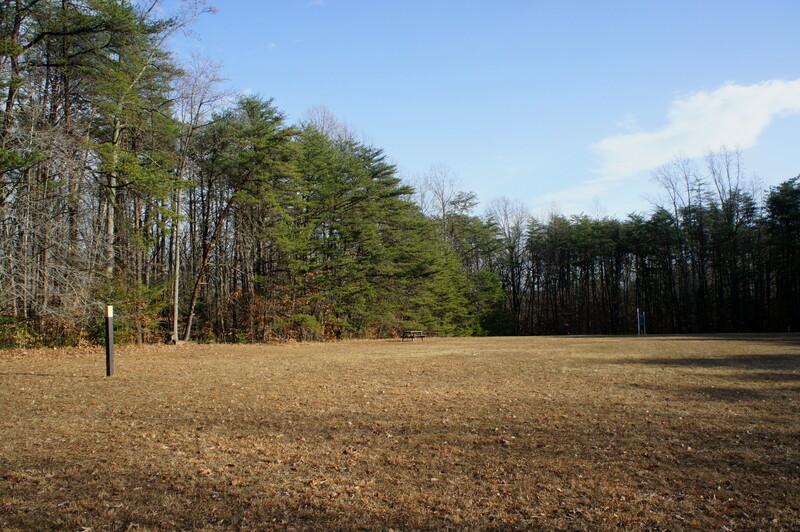 This open expanse—known as Williams Ball Field—is rimmed with trees, most noticeably a fine stand of pines and hemlocks to the north, south, and east. 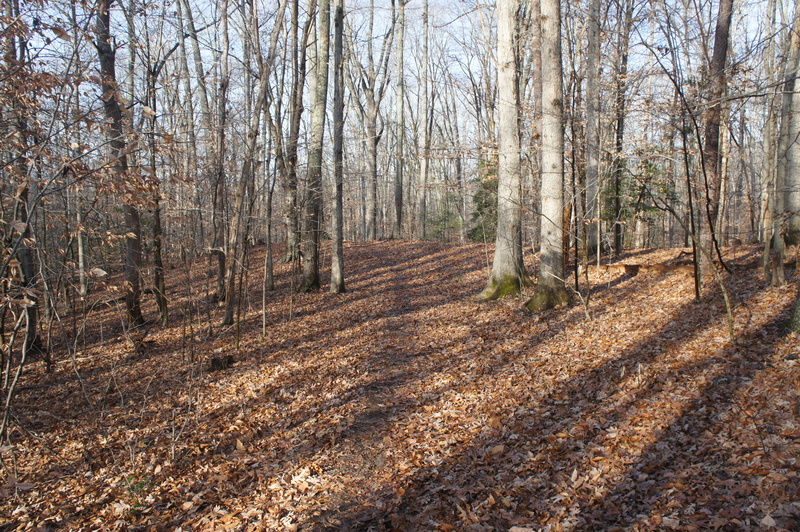 Continue across the field to its northeast corner, where the trail continues and dives back into the forest. From here, the path descends a woody slope and comes within striking distance of the picnic pavilion, before ending at a road and parking area just to the west. Take a left on Telegraph Road and follow it for about 70 yards, then look for a sign marking the beginning of The Crossing Trail on the right. After the wayside, the trail heads north, paralleling a broad ravine to the left, then splits. 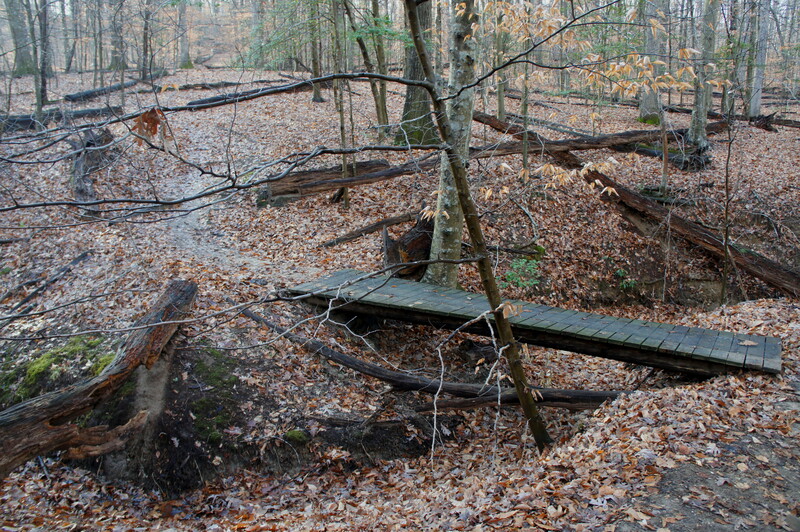 Stay right on the broader, more obvious path, leaving The Crossing Trail behind. Now you are on a spur of the red-blazed Birch Bluff Trail. Bending to the west, the narrowing path follows the spine of a low ridge, then drops steeply and crosses an old dirt doubletrack at 6/10 mile. Stay on the red-blazed path, which descends to cross a wooden footbridge, then hugs the right flank of a shallow ravine as it bears south. At 8/10 mile, the trail hews right, leaving the ravine and heading north again, then crests a low hill. From here it’s a short descent to another old fire road, where you should take a left on the path, which doubles as the yellow-blazed Laurel Loop Trail. Follow the gently-climbing path to its southern terminus and emerge at a grassy field just west of the Visitor Center, completing the 1.1-mile loop. 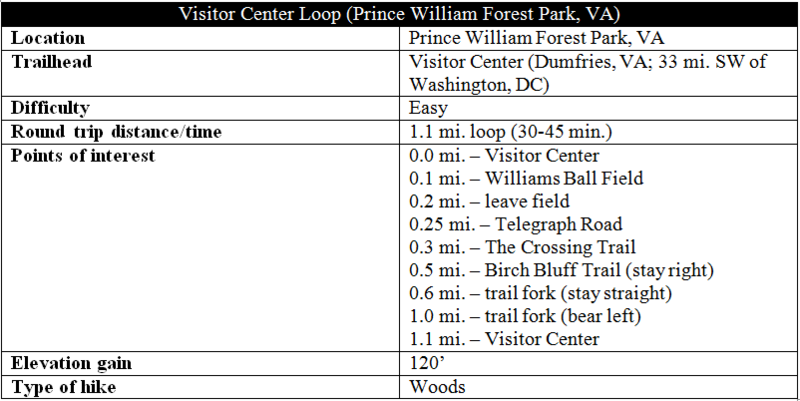 This entry was posted in Easy Hikes, Prince William Forest Park, Revolutionary War, Virginia and tagged Birch Bluff Trail, historic, Laurel Loop Trail, loop hike, Prince William Forest Park, Revolutionary War, Telegraph Road, The Crossing Trail, Virginia, Visitor Center, Visitor Center Loop, Williams Ball Field. Bookmark the permalink.